Biolage R.A.W. Recover Shampoo is rated 5.0 out of 5 by 6. 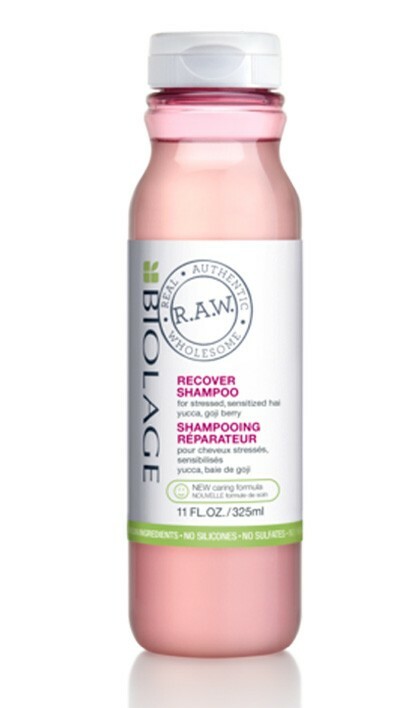 Share https://www.matrix.com/biolage/raw/raw-products/recover/raw-recover-shampoo R.A.W. Recover Shampoo for Damaged Hairhttps://www.matrix.com/~/media/images/product-images/biolage/biolageraw/recover/raw reformation_recover.jpg Restores shine to stressed, sensitized hair with yucca & goji berry. Biolage R.A.W. Recover Shampoo has an improved formula with natural-origin emollients from sources such as coconut. Recover Shampoo's formula with yucca and goji berry, helps restore shine to stressed, sensitized hair and leaves it feeling replenished. PROFESSIONAL BY NATURE. Biolage has crafted potent formulas from natural origin for uncompromised, healthy-hair results. HONEST BY CHOICE. Biolage R.A.W. is Real, Authentic, Wholesome. Aqua / Water / Eau, Decyl Glucoside, Sodium Lauroyl Methyl Isethionate, Glyceryl Oleate, Cocamide Mipa, Citric Acid, Parfum / Fragrance, Hydroxypropyl Guar Hydroxypropyltrimonium Chloride, Sclerotium Gum, Sodium Benzoate, Salicylic Acid, Trisodium Ethylenediamine Disuccinate, Sodium Lauroyl Sarcosinate, Glycerin, Hydroxycitronellal, Linalool, Coumarin, Hydrogenated Palm Glycerides Citrate, Lycium Barbarum Fruit Extract, Yucca Glauca Root Extract, Lecithin, Lactic Acid. Apply to wet hair with a massaging motion. Follow with Biolage R.A.W. Recover Conditioner for best results. Rated 5 out of 5 by Gina16 from Hooked from Day 1 My hair is long, slightly wavy with much frizz. I'm on my 3rd set of RAW Recover Shampoo & Conditioner and I absolutely love this stuff. After blow drying&flat ironing or spiral curling daily, it was dry, breaking, dull&full of frizz. My aunt gave me some to try& I've been hooked ever since. Its non of what I mentioned above instead my hair looks&feels thick & is so shiny. (as if I put gloss on it) & soft I get compliments all the time about how shiny & healthy my hair looks. You've got a customer for life, I do highly recommend using the conditioner with the shampoo, for me they worked best together. Rated 5 out of 5 by KatieN from Very Nice! I love this shampoo and conditioner. They do nourish my hair and smell great. Rated 5 out of 5 by quadmom from AWESOME I received a free sample from ulta and I loved this shampoo and conditioner so much. I have blonde highlighted hair that I use a flat iron on everyday. This product makes my hair look fantastic. No dry looking ends. Rated 5 out of 5 by StacyJack from My hair feels incredible. Just got this and used a couple of times. Love it. My hair feels and smells incredible.